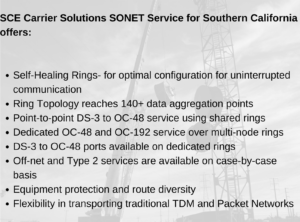 SCE Carrier Solutions offers SONET service for Southern California that expands across a large fiber optic network of over 5,700 route miles. Our services help you reliably transmit large volumes of data and multiple network traffic types. Lost signal or having a low quality network signal reduces productivity, efficiency and accessibility for enterprises and carriers. SCE Carrier Solutions’ SONET Service reduces the chances of signal loss with continuous SONET architecture. SONET service also improves efficiency with ring topology reaching over 140 data aggregation points and self-healing rings for uninterrupted service. Managing a proprietary network service like SONET is costly and time-consuming, requiring high technical expertise. Breakdowns and failures in a SONET service is also an expensive process, due to downtime costs involved and the high failure fix price. SCE Carrier Solutions’ reduces these costs to enterprises and carriers with complete SONET architecture in Southern California. SCE Carrier Solutions offers technical support and management for any of your legacy SONET systems that you may want to transition to wavelength or ethernet services. Being local to Southern California, SCE Carrier can dedicate their service to local enterprises and carriers.